Bioethics is an applied discipline that takes the principles of ethics and applies them to biological research, science and medicine. Safe, ethical and patient-centered decision-making has always been at the center of how we do business. It is rooted in Our Credo values and our commitment to put the needs of the people we serve first. We support and adhere to the fundamental principles of bioethics, including beneficence, non-maleficence, autonomy and justice. Our Ethical Code of Conduct for R&D guides our employees and those with whom we partner in medical research; it outlines our philosophy and standards about ethical decision-making. However, the ethical questions in the healthcare industry can be so complex that they require broad-based multidisciplinary discussion involving different experts. With this in mind, the Johnson & Johnson Office of the Chief Medical Officer (OCMO) relaunched a global Johnson & Johnson Bioethics Committee (JJBC) in 2016 and further formalized its role and mandate in 2017. JJBC serves as an advisory body and an independent expert forum to our teams worldwide on ethical issues. It is composed of Johnson & Johnson employees across different functions, business segments, regions and countries, each with a passion for bioethics. JJBC also engages globally recognized external consultants with expertise in bioethics to provide input on an as-needed basis. JJBC’s core objectives are: advocating adherence to bioethical principles; providing an expert forum to obtain guidance on ethical issues for Johnson & Johnson teams; and championing our commitment to ethical decision-making across the enterprise. 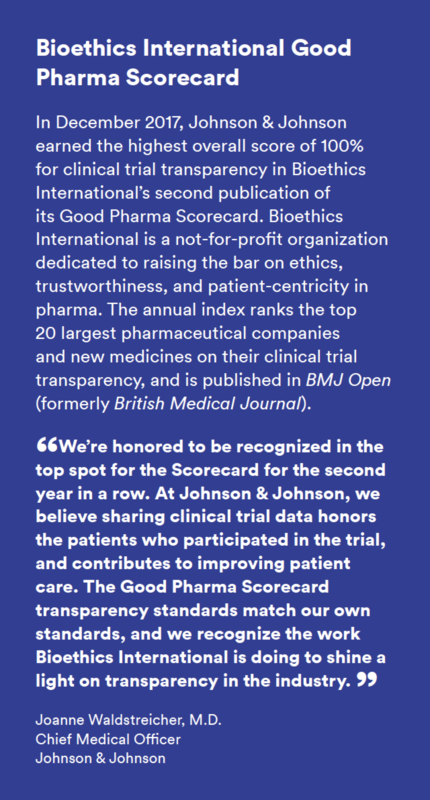 In addition to influencing our own decisions, Johnson & Johnson’s longstanding commitment to bioethics, has earned us recognition as an industry leader in ethics-based decision-making. The work taking place in OCMO has positive impact on the dialogue about two key bioethical issues: clinical trial data transparency and access to investigational medicines. Clinical trials conducted around the world by our pharmaceutical, medical devices and consumer product companies are listed on the U.S. National Institutes of Health’s website, www.clinicaltrials.gov, the European Clinical Trial Register, and country-specific and regional registries across the globe, as required. We seek to publish the results of company-sponsored trials in patients and health economic studies in peer-reviewed medical journals. We believe that by sharing our clinical trial data we advance the science that is the foundation of medicine and honor the patients who participate in clinical trials who want to make a difference for themselves and other patients in the future. 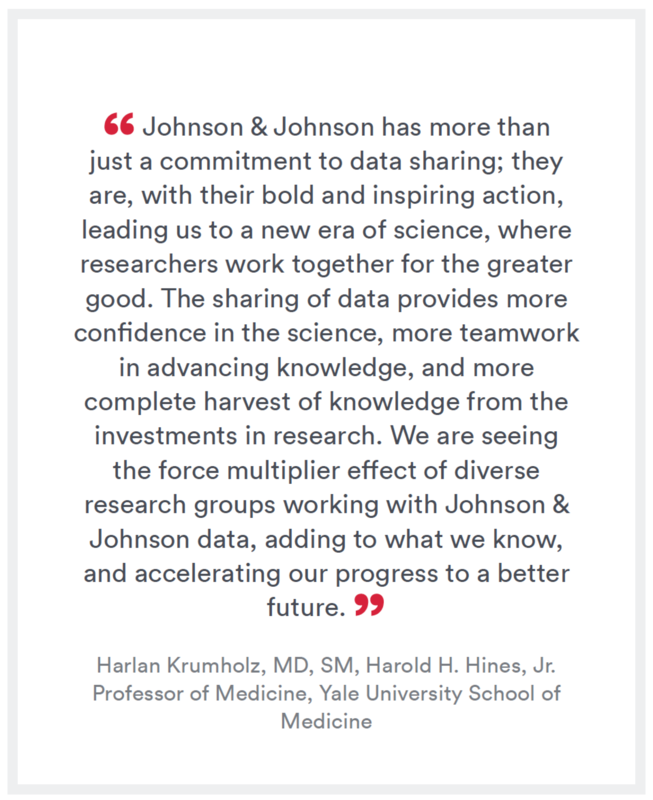 Through groundbreaking partnerships, including our participation in the Yale Open Data Access (YODA) Project, we are sharing pharmaceutical, device and consumer product clinical trial data with researchers and physicians around the world. In 2017, Johnson & Johnson’s Consumer business segment became the first consumer company to make clinical trial data available to researchers through the YODA Project. We felt it was important for the millions of consumers who use our products every day to know we are committed to rigorous scientific assessments supporting the safety and efficacy of all our healthcare products, including consumer products. For patients with serious or life-threatening health conditions, experimental treatments may offer a way forward when all existing options have been exhausted and clinical trials are not an option. Our Company is involved in R&D of life-saving medicines, and it is our responsibility to help people who urgently need new treatment options in a way that doesn’t put the individual or the larger patient community at risk of unnecessary harm. Access can take many forms, and most patients attain access to investigational medicines through participation in clinical trials. For late-stage medicines in development for life-threatening conditions, we generally create a formal Expanded Access Program (EAP) that provides a protocol-driven path to gain access for patients, similar to those who participated in the clinical trials. For patients who don’t qualify for trials or EAPs, or have a need when these programs are not enrolling, we also provide access through compassionate use, or single-patient requests. To help provide a fair, ethical evaluation of compassionate use requests, the Janssen Pharmaceutical Companies of Johnson & Johnson employs the Compassionate Use Advisory Committee (CompAC) globally. Developed in collaboration with New York University Langone Health, CompAC facilitates the review of compassionate use requests by an independent, external body of internationally recognized medical experts, bioethicists and patient representatives. After a successful pilot that began in 2015, CompAC was expanded to include additional investigational medicines in development at Janssen. In 2017, Johnson & Johnson was awarded an Ethical Leadership Award by the Fellowships at Auschwitz for the Study of Professional Ethics. This award was given in recognition of our leadership in both the areas of compassionate use for our work on CompAC, as well as our approach to sharing our clinical trial data through the YODA Project. Last year, Janssen was one of several industry collaborators supporting the launch of the Reagan-Udall Foundation’s Expanded Access (EA) Navigator, the first-of-its-kind website that provides patients, caregivers and physicians with critical information about EA. The EA Navigator represents a unique private-public partnership among advocacy, government and industry communities to create a resource that addresses the critical need to understand options when commercially available treatments have been exhausted and clinical trials are not an option. At Johnson & Johnson, we work tirelessly to impact the trajectory of human health. From the beginning, our focus has been on bringing life-altering products to patients and consumers to enhance well-being everywhere. Our commitment, since 1886, has led to such breakthroughs as BAND-AID® Brand Adhesive Bandages, IMBRUVICA and the ATTUNE knee system. Johnson & Johnson can deliver these innovative products and technologies because of our rigorous research. Where this research involves animals, we employ every method available to safeguard their welfare. This includes ethical review committees, personnel training, and ensuring that all Johnson & Johnson Animal facilities are AAALAC (Association for Assessment and Accreditation of Laboratory Animal Care International) accredited. We are deeply aware of the need to continue discovering and developing alternatives to animal testing, while keeping the same scientific rigor necessary for patient and consumer safety. To promote our commitment to the 3Rs, Johnson & Johnson offers annual 3R and Post-Doctoral awards to recognize significant and impactful achievements in the development of viable refinements and alternatives to the use of animals. We also partner with the Institute for In Vitro Sciences and the Center for Alternatives for Animal Testing. In 2017, Johnson & Johnson updated and formalized a Policy on the Humane Care and Use of Animals, which directs our operating companies on the ethical and humane treatment of animals, and promotes the use of non-animal alternatives whenever feasible. We continually monitor changes to the Animal Welfare Act and international regulatory requirements to ensure that our animal welfare guidelines are current with the law. All research protocols involving the use of animals are reviewed for approval by Institutional Animal Care and Use, or by Ethical Committees, or under license by local or regional governmental agencies.